NASHVILLE, Tenn.—Pastors are eager to reach the next generation for Christ as well as growing the size, diversity and level of discipleship within their congregations, according to a new survey of 1,000 Protestant pastors by Nashville-based LifeWay Research. 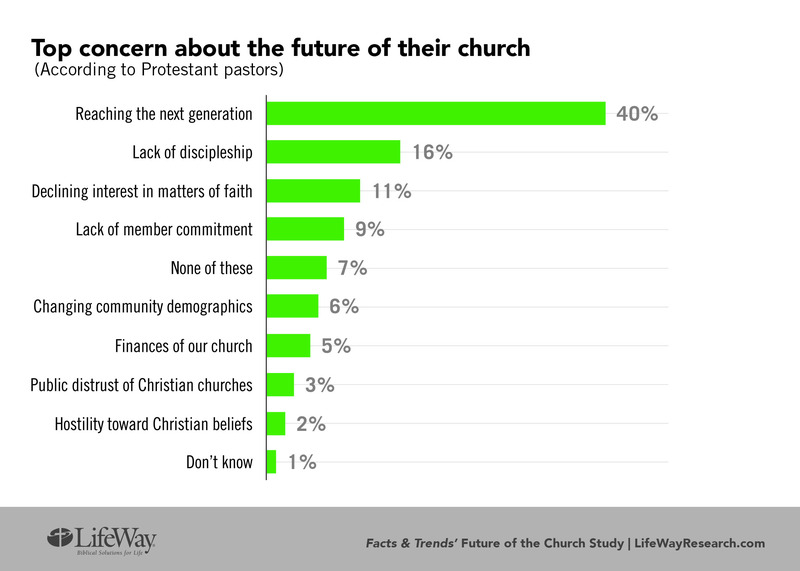 The 2019 Future of the Church Study by Facts & Trends and LifeWay Research is based on a survey of Protestant pastors, examining their views on the future of their congregations. Results of the study are explored in the Winter 2019 issue of Facts & Trends available at FactsAndTrends.net/FutureChurch. Looking toward to the future, many pastors anticipate numerical growth of their congregations, increased ethnic diversity, more leadership roles for women, and robust community engagement by church members. The survey found 79 percent of pastors say weekly worship attendance at their church will increase in the next five years. 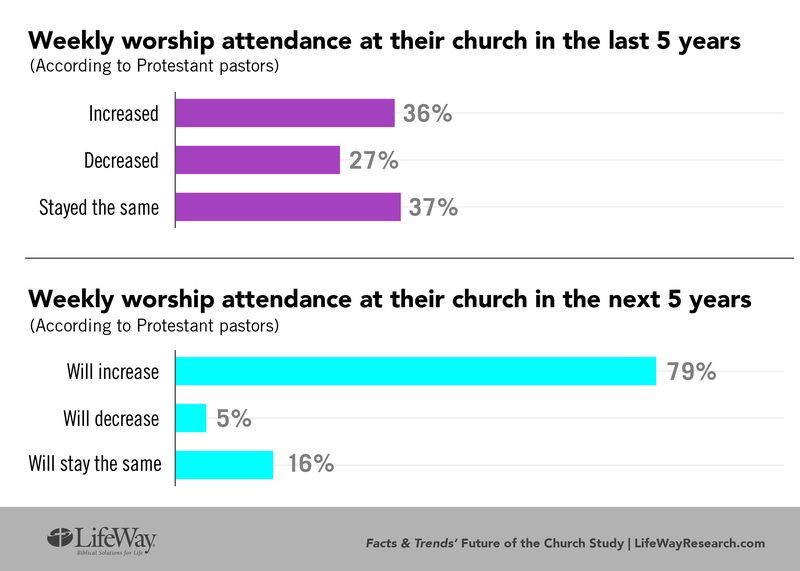 But looking at the last five years, only 36 percent of pastors say worship attendance growth increased, while two-thirds say attendance stayed the same or declined (27 percent decreased, 37 percent stayed the same). Pastors more likely to say worship attendance grew in the past five years include those from ethnicities other than white or African American (50 percent), those pastors aged 18 to 54 (41 percent), Baptists (41 percent), those leading a congregation of 250 or more in worship (56 percent) and those minister­ing in a western state (43 percent). “There is a sharp contrast between how many pastors think their churches are going to grow and how few are actually growing.” McConnell asked. “We have one-third with worship attendance growing and 79 percent who say it’s going to grow in the next five years. Looking five years out, anticipation for growth in worship attendance is strongest among pastors ages 45 to 54 (85 percent), evangelicals (85 percent), Pentecostals (94 percent) and pastors with worship attendance of 250 or more (91 percent). The Future of the Church survey asked pastors if attendance by 18- to 29-year-olds in the past five years increased, decreased or stayed the same at their church. Almost a third (32 percent) say attendance of young adults increased, while 29 percent say attendance decreased and 39 percent say it stayed the same. Researchers found answers varied among pastors when it came to age, denomination and church size. Pastors age 18-44 (43 percent) are more likely to select “increased” than those 55-64 (27 percent) and 65 and older (25 percent). Baptist (40 percent) and Holiness (43 percent) pastors are more likely to select “increased” than Lutherans (24 percent), Methodists (16 percent) and Presbyterian/Reformed (28 percent). Pastors of churches with attendance of 250 or greater are the most likely to select “increased” (50 percent) followed by those with an attendance of 100-249 (36 percent), 50-99 (30 percent) and 0-49 (20 percent). When asked about worship attendance by 18- to 29-year-olds in the next five years, more than 7 in 10 (72 percent) pastors say they expect to see growth. A quarter say they expect attendance of young adults to stay the same while 4 percent expect a decrease. Pastors most likely to select “will increase” include African American pastors (89 percent) and pastors of churches with worship attendance of 250 and higher (85 percent). A recent development in Protestant churches is the growth of ethnic diversity among worship attendees and leaders who are women or people of color. A third of pastors told LifeWay Research the ethnic diversity of worship attendees at their church grew the last five years. Sixty-two percent say it stayed the same and 4 percent say ethnic diversity decreased. Looking toward the next five years, a majority of pastors (62 percent) say the ethnic diversity of worship attendees will increase. When LifeWay Research asked pastors about the ethnic diversity of leaders in the next five years, half of pastors (52 percent) say ethnic diversity will increase and half (48 percent) say it will stay the same. Less than 1 percent say it will decrease. In a similar question about women in leadership roles, almost half of pastors (47 percent) say they saw an increase of women in leadership roles the last five years. Another 52 percent say women in leadership roles stayed the same. Looking to the next five years, 42 percent pastors say women in leadership roles will increase, 2 percent say it will decrease, and 56 percent say it will stay the same. “To see that women in leadership of some kind is growing is pretty telling,” McConnell says. “That has to impact the church cul­turally. For women, the message they’re hearing is about their value and role in Kingdom work. 64 percent say ministry in their community increased the last five years at their church compared to 4 percent who say it decreased and 32 percent who say it stayed the same. 85 percent say ministry in their community will increase the next five years, while 1 percent say it will decrease and 15 percent say it will stay the same. 28 percent say denominational involvement at their church increased the last five years compared to 10 percent who say it decreased and 62 percent who say it stayed the same. 32 percent say denominational involvement will increase in the next five years, while 6 percent say it will decrease and 62 percent say it will stay the same. Timothy C. Morgan is the director of the Journalism Certificate Program at Wheaton College in Illinois. 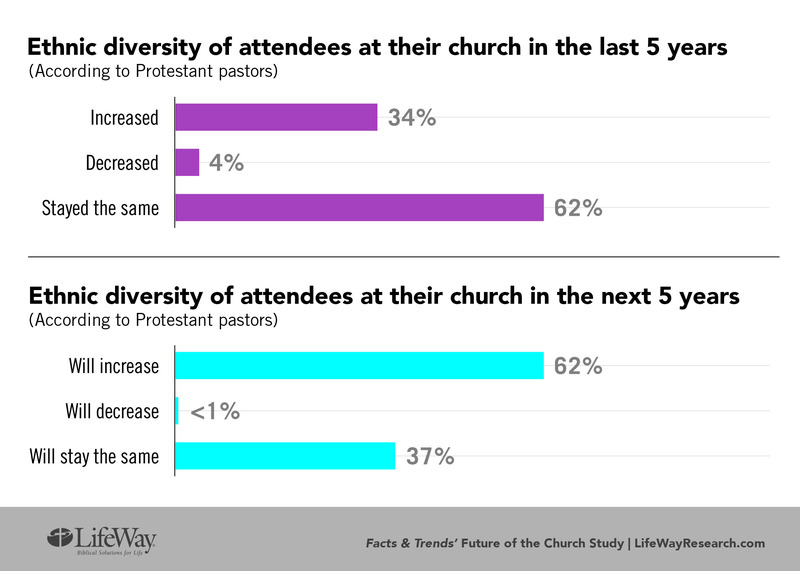 LifeWay Research conducted The Future of the Church Study for Facts & Trends. The phone survey of 1,000 Protestant pastors was conducted June 19 – July 2, 2018. The calling list was a stratified random sample, drawn from a list of all Protestant churches. Quotas were used for church size. Each interview was conducted with the senior pastor, minister or priest of the church called. Responses were weighted by region to more accurately reflect the population. The sample provides 95 percent confidence that the sampling error does not exceed plus or minus 3.2 percent. Margins of error are higher in sub-groups.